for my quarter of a century challenge! 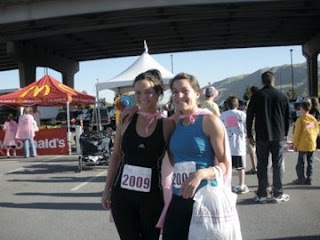 This weekend my friend and I ran Race for the Cure... This is the second race in my 25 countdown..
and two, there were so many people! 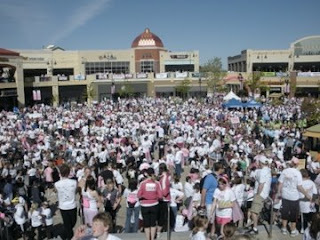 I could not believe all the people that came out to support such a great cause. The street was literally full of people for as long as I could see. Although my friend and I went to run, we walked because of all the people. I was happy to be part of something so great! Awesome! Wish I could have been there and done it with you. 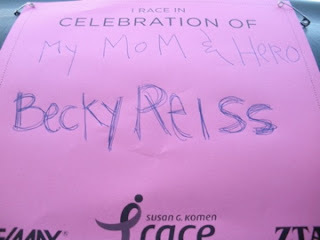 That sign "My mom and hero, Becky Reiss" brought tears to my eyes. What a wonderful cause. I'm so proud of you! That sign also brought tears to MY eyes! I have only met your mom once (I think) and I LOVED her. She seems like such an incredible lady.